Amazing Storm Surge Video Seen Worldwide !! 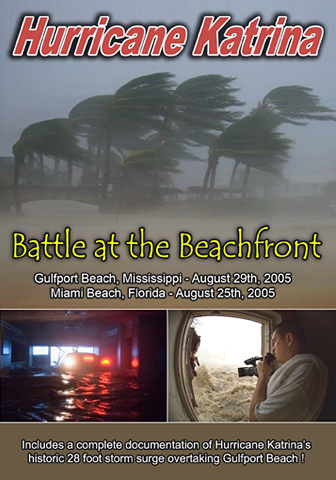 "Battle at the Beachfront" DVD released 08/26/06 highway 90 along Gulfport Beach, Mississippi. 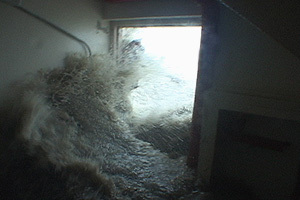 The Theiss-Device Storm Cam recorded a new and unseen vantage point to show the raw power of water when unleashed as Storm Surge. 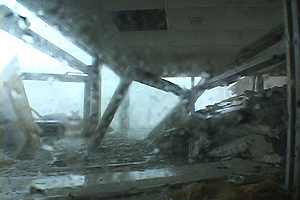 Watch as the Cam records the first floor of the hotel being submerged and destroyed. 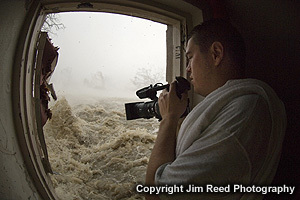 Having gone through this hell myself, Mike and Jim do a superb job with pictures and personal accounts taking you through the costliest Natural Disaster in US History ! I found your Battle at the Beachfront very helpful in understanding the wind vs. water debate. I was interested in the tree positions of due east to due west before the surge. I was able to review the aerials and my own pictures to note which trees were held in place east to west by falling on a structure before the surge. The water was certainly deep enough to float any other trees that had fallen. We may never know original tree positions from a tornado before the surge. I recognize where you were in the car and wondered if you at least though you might not get back to the hotel when the real fast surge came. One of the lingering psychological effects of experiencing the surge of Camille was the shaking of the house. I went to LSU a few weeks later and had to stand up every time a train shook the ground of my apartment. On this anniversary of the second landfall of Hurricane Katrina, I had the opportunity to watch Mike Theiss' and Jim Reed's DVD documenting the two landfalls of Katrina. The first section shows the surprisingly strong winds and flooding during the initial landfall at Miami Beach/Ft Lauderdale. There is also flooding in Homestead, Florida. 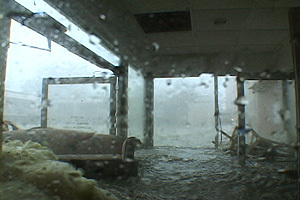 The main part of the DVD shows the wild winds and 28 foot storm surge in Gulfport. 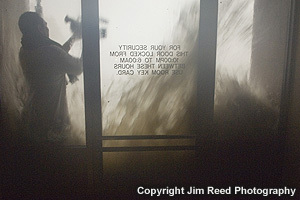 Jim Reed and Mike Theiss shot some amazing video of the high winds and rapidly rising storm surge. This is the famous footage shown on MSNBC of the Gulf of Mexico waters against the glass doors of the hotel, then rushing into the lobby along with a floating car. 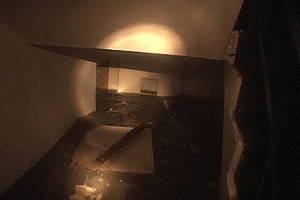 They have to flee upstairs from the rising flood waters and imbedded debris. If you are a hurricane chaser, don't show this to loved ones as they may become too worried and fuss the next time you go chasing! 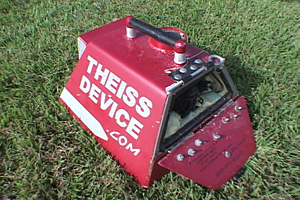 As an added feature, there is the Theiss-Device video. This encased waterproof camera was originally designed for tornadoes but took some amazing eye level video of the storm surge coming in on the first floor. 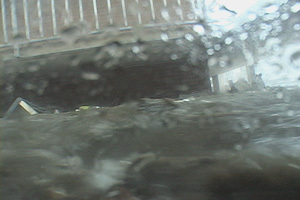 The camera is washed away and floats with other debris in the surge (still taking video). This is an amazing perspective that couldn't be safely done by a person. There is also a great scene of water coming upwards in a stairwell. As quick as the surge comes in, the waters recede. Bonus features include a slide show of more surge scenes and resulting damage with mainly Jim Reed's award winning photography. There is also an examination of the Theiss-Device storm camera and "deleted scenes" of the arrival and initial documentation of the arrival of Katrina in Gulfport. The video and sound quality is great. Total length of the DVD is 76 minutes. I have already seen some of the footage on MSNBC but that doesn't compare to seeing everything in context and produced by the chasers rather than assembled by less knowledgeable media personnel. I highly recommend this DVD for anyone interested in severe weather, flooding and hurricanes. As I watched your DVD, my heart rate began to rise. My mouth probably stayed half open most of the time as a response to my total amazement at what I was seeing and hearing. I think it's great that you had the natural sounds of the events (the thing I hate about most weather event shows is the goofy background music muffling the real sounds of the weather). The other times my mouth wasn't open, I was saying Oh my God, or I can't believe this. By the time the DVD got to 11:17 a.m., I was in tears just thinking of the losses. Katrina just left me breathless in those initial days as I searched the internet boards and posted "looking for" messages for my friends in Ocean Springs, MS. As a strange result, thought, it all brought me new friends as well. Through the whole experience of watching what you guys so bravely documented, I could begin to get more of a grasp on what people were actually dealing with when they had stayed to ride it out... or were caught, as was one of my friends. Seeing all of the devastation in pictures and video on the internet and in the news on T.V. in those first few weeks, I just couldn't imagine how the devastation that I saw was actually done... the processes involved. Your documentation really gave insight into how the water was acting and how its force was working on everything in its path. The force of the repetitious wave-action became clearer to me...not to mention the forces of the constant wind and all of that debris! My gosh! So, guys... thanks again for doing what you did. I hope you get the funding needed for the Theiss Device. If I were a corporation, I'd be all in!! Since I'm not, I'm gonna blog about you guys, the Theiss Device, and the DVD. Your book and video were excellent. I purchased 2 videos which I received today in the mail. I called the Beachfront Hotel to order them. I have to say they were very good. I think you guys are crazy for risking your lives like that, but on the other hand we wouldn't have the images and videos if you did not go out to get all this material. Keep up the excellent work and be careful out there. Hi, I have just ordered your DVD and book on Katrina. Thank you for making this historic video – we were living in Biloxi, MS at the time not too far from where you filmed. We had evacuated to Florida and thankfully we did. Our home took 5 feet of water and we lost a lot of our belongings. It was a horrific time for us all in the area. I am grateful that I am now living in Illinois, (tornados our concern now!!) and I am glad I do not have to live through another hurricane. We are still in recovery from this event as are many and it will be something we never get over 100% - however we are better off than many and also grateful for that. My 13 year old twin daughters lived through the experience with us and for them I appreciate the documented events of the time – so even though I think you are stark raving mad (said in the nicest possible way) I appreciate the fact that there are mad people like you out there! I just got my copy of Battle at the beachfront, and was so impressed at what you've done. As a resident of Ms, who went through it, you really captured the storm like none other that I've seen. Thank you- I'm ordering another copy for my parents in Florida. 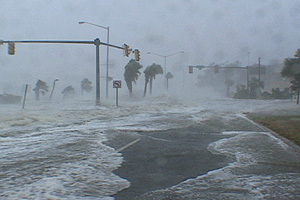 I received my "Hurricane Katrina - Battle at the Beachfront" DVD today and watched it this evening. Very impressive and amazing footage and photos. 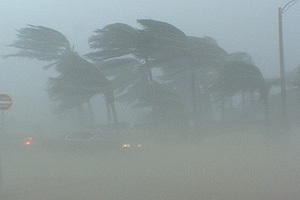 It is unreal the damage that a hurricane can cause. Thank you for documenting this storm and making it available. 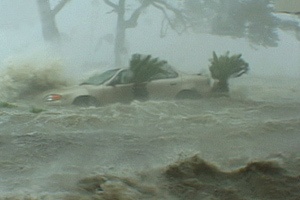 Thank you for sharing the video of Hurricane Katrina's landfall in Gulfport, MS in August, 2005. It really shocked me and hopefully will shock others who think that a hurricane is an occasion worthy of a party or staying at home. I hope that footage from you and others who make such videos is used to teach the millions of Americans, Mexicans and others who live in the West Indies that these storms are not to be taken lightly. Once again, many thanks. 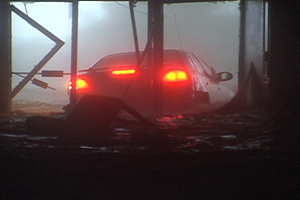 "Ultimate Chase" ® is a registered trademark of Ultimate Chase, Inc.
All Hurricane Katrina video stills and sample video throughout this site are copyrighted and protected under United States and International copyright laws. The photographs, video stills, and video may not be reproduced in any form, downloaded, stored, or manipulated without prior permission from © Ultimate Chase, Inc. All Rights Reserved.